1-CD with 20-page booklet, 13 tracks, playing time 39 mns. Takes Johnny Cash's prison album concept to a new dimension! 'One of the all-time greatest... and most tasteless... LP covers! Incredibly rare first LP by the rockabilly singer who recorded for Sun and Gone Records, and went on to write songs for Jerry Lee Lewis and many others! 'Includes a rare bonus single... the original version of Jerry Lee Lewis' Meat Man. In the '50s Mack Vickery recorded at Sun Records and then for Gone Records. His first LP in 1970 was an all-time classic, 'Live At The Alabama Women's Prison', now reissued for the first time. It featured one of the greatest sleeve designs of all time and the music was no less impressive: Mack Vickery sang his heart out in front of convicted females starved for music, love and affection. 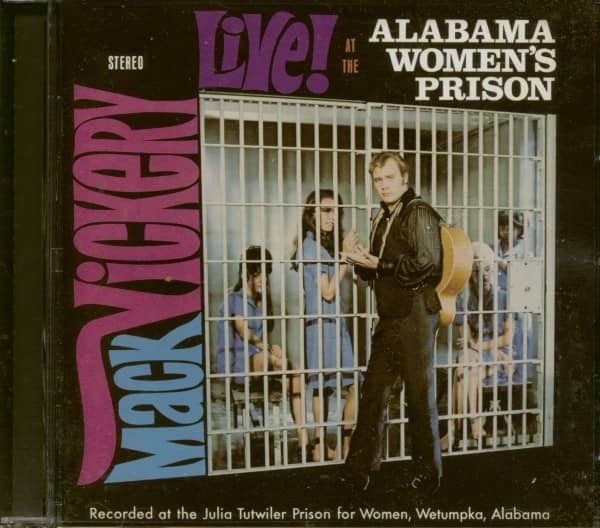 Mack Vickery's record met with plenty of resistance, and the record company soon went bankrupt. (2008/BEAR FAMILY) 14 tracks (39:04) with 20 page booklet. A legend within an admittedly small circle, Willard Mack Vickery is chiefly known among rockabilly fans for a few records on long-gone labels and for writing songs that spoke to Jerry Lee Lewis on many levels. But he also wrote top-selling songs for Tanya Tucker, Waylon Jennings, George Strait, Johnny Paycheck, and many others. We catch up with him in 1970 at the unlikeliest of all places, the Alabama Women's Prison. 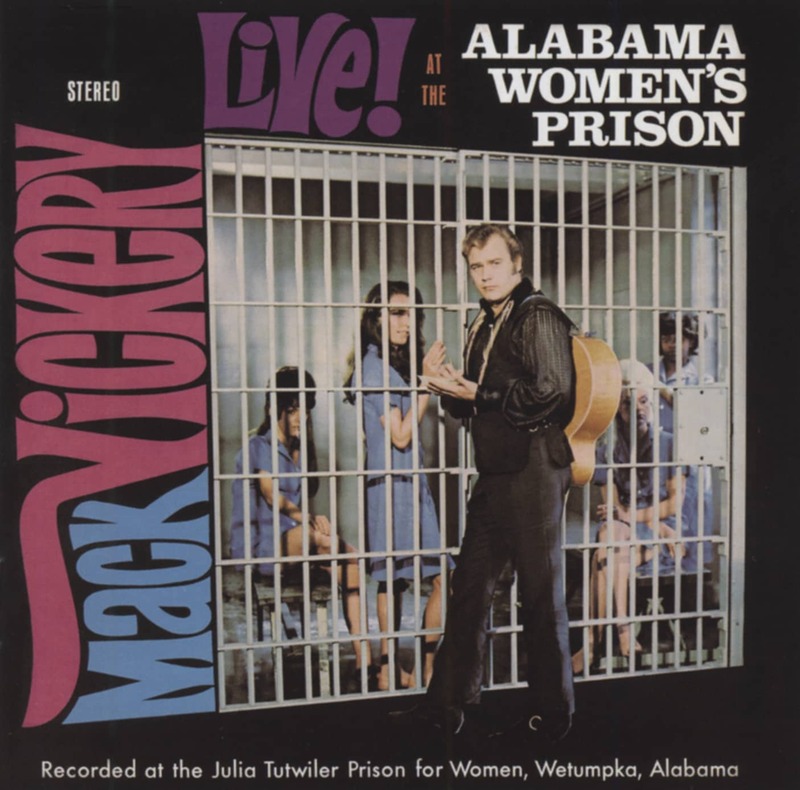 His 'Live At The Alabama Women's Prison' LP, featured one of the all-time most striking jacket designs, and the music was no less impressive. 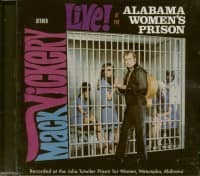 Mack Vickery sang his heart out in front of convicted females starved for music, love and affection. 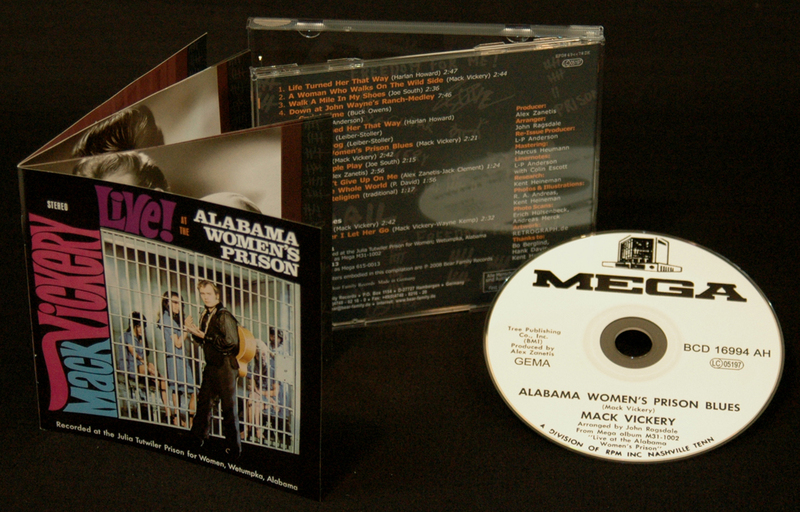 Only a few Porter Wagoner albums were housed in jackets as epically tasteless as 'Live At the Alabama Women's Prison'. With four fabulously attractive women behind bars, it's hard to tell if the convicts want to get out or if the singer wants to get in. Were these women typical of the population at the Alabama Women's Prison? Probably not. Were they even part of the inmate population in Alabama or anywhere? Almost certainly not. When asked about the recording Mack Vickery's reply was short: "Hot, it sure was hot." Vickery might have performed in front of bigger audiences, but never one so passionate. The idea came after hearing Cash's 'Live At Folsom Prison' and it took some serious effort to get permission to bring musicians and recording equipment inside the building. 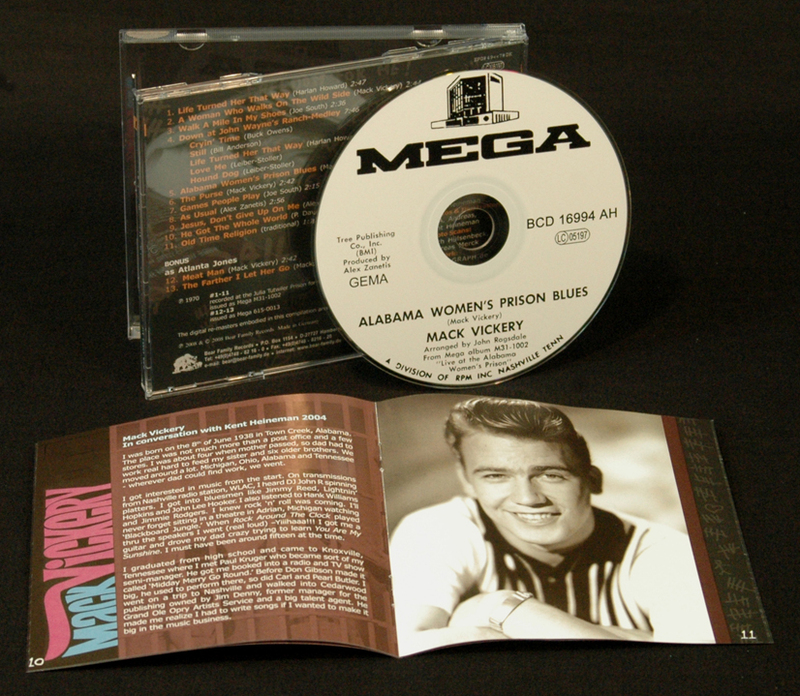 According to Vickery's long-time associate, songwriter Merle Kilgore, Vickery went down to Alabama and got buddy-buddy with the female warden. After a few drinks she was talked into letting the singer come down to record. Vickery came on stage shaking like Elvis and the women went wild. The unknown man in the equation was songwriter Alex Zanetis, who'd written hits for Brenda Lee (As Usual), Jim Reeves (Guilty), and others. An article in the 'Nashville Tennessean' in October 1970 states that Zanetis "has just finished an album of prison songs for women," so it seems likely that the project originated with him rather than Vickery. Zanetis certainly produced the record. Eighty percent of the convicts at Julia Tutwiler Prison were inside for killing cheating husbands or two-timing lovers. Vickery took notice and picked his repertoire carefully. 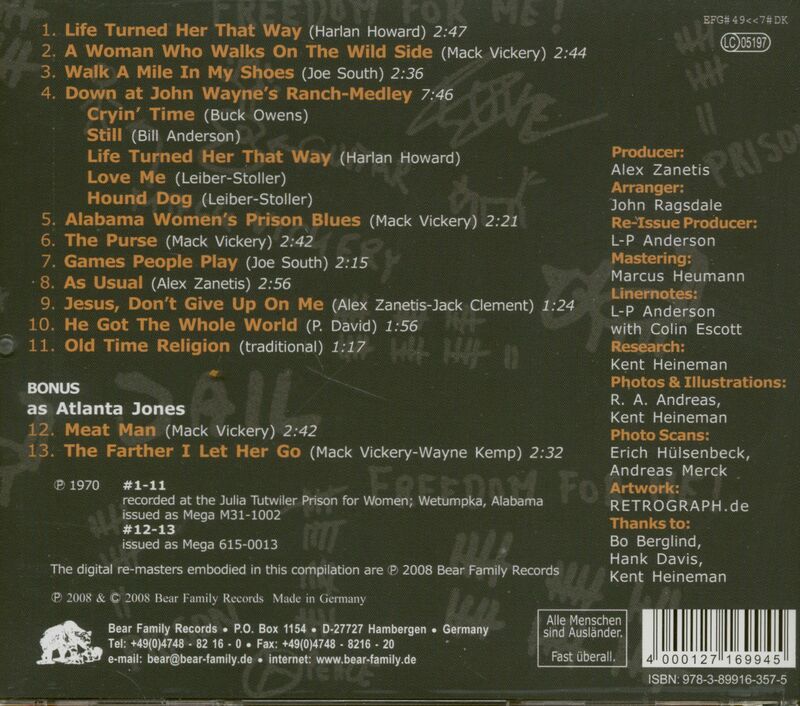 Titles such as Life Turned Her That Way, A Woman Who Walks On The Wild Side, Alabama Women's Prison Blues and Walk A Mile In My Shoes fit the occasion perfectly. 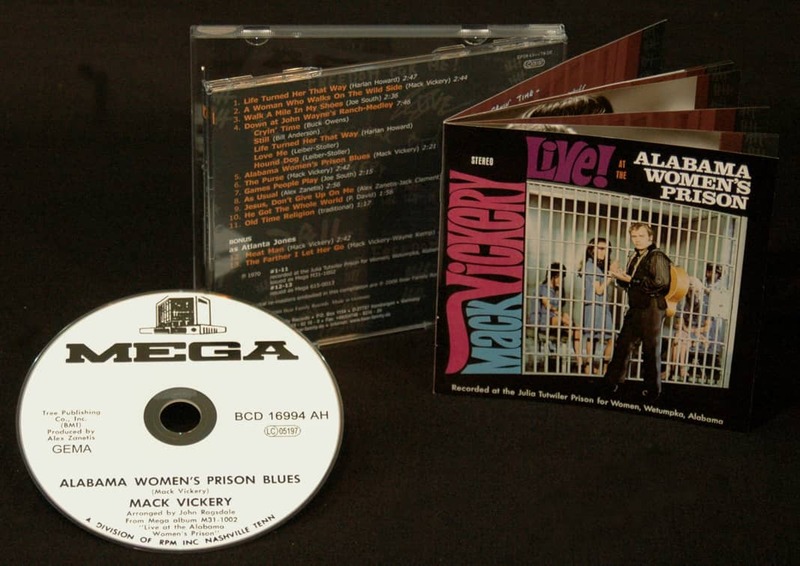 On this CD, the original album has been expanded with the non-album single, Meat Man b/w The Farther I Let Her Go, originating from Vickery's short stint with Mega Records. From correspondence left by Mega's president, Brad McCuen, it seems as if the single was originally meant to be Meat Man backed with a song that has disappeared, Boston's Busiest Peeping Tom. That single was intended to be released under the name Cutty Love, but they eventually opted for Atlanta James and changed the B-side. Mack Vickery's recording history way predates 'Live At The Alabama Women's Prison.' Born in Town Creek, Alabama, on June 8, 1938, he moved around the Ohio valley and Tennessee before eventually settling in the Detroit area. In 1957, he and some buddies auditioned at Sun, and Vickery says that Sam Phillips told him to stick around, but he returned home instead. The following year, he recorded for the Santa Monica, California-based Princeton Records. High School Blues was his first record, and Vickery says that it was recorded at Cobra's studio in Chicago with Otis Rush and Wild Bill Emerson on guitars. High School Blues reached the attention of one of George Goldner's promo men, who gave him Goldner's phone number. Vickery recalled phoning Goldner one Sunday evening, saying "I've got some songs that'll make you and me a million dollars." Goldner wouldn't be the last to hear that line, but he brought Vickery to New York, where he recorded A Lover's Plea. Vickery says it was breaking when Goldner was caught up in the payola investigations. There was a record for Jamie and another for Afco before Vickery's thoughts turned to songwriting. Customer evaluation for "Live At The Alabama Women's Prison, plus"